Like Hillary Clinton and Ted Cruz, Pataki has a BA from an elite school (Yale) and a law degree from another elite school (Columbia). Pataki was a lawyer for a decade, became mayor of Peeskill, New York in 1981, and jumped to the state legislature in 1984. He was elected governor a decade later, and remained governor until 2006, when he chose not to run for a fourth term. Since then, Pataki has been in dry dock, returning to his law practice and flirting with runs for senate and the presidency. But this is the first time he has chosen to contest an election since 2002. The formula for success is simple: If you cut taxes and spending, you’ll get a high grade. Raise them, and you’ll get a low grade. When Cato is upset, it means that we’ve got a politician who cares to some degree about the population’s well-being and acknowledges to some degree that the state has responsibilities to uphold here. As with Huckabee, Cato is still mad at Pataki and continues to actively try to sink his political career. When Pataki arrived in 1994, US per capita GDP was 85.7% of New York’s. During Pataki’s conservative period, things didn’t change much. 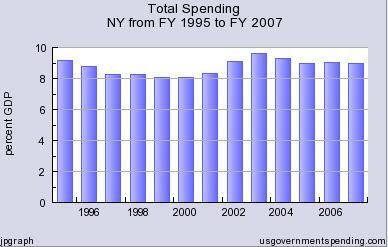 In 1997, US per capita GDP was still 85.4% of New York’s. As Pataki reversed course and the stock and housing bubbles arrived, New York’s edge grew. By 2006, at the end of Pataki’s run, the gap had increased and the national average was down to 81.5%. 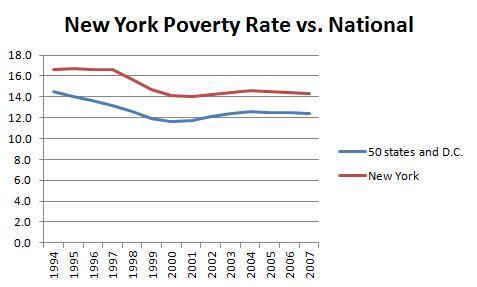 The crisis pushed this gap even wider, and in 2013 the national average is only 78.6% of New York’s. This echoes the growth of economic inequality that has been occurring nationwide in recent years. New York’s strong performance certainly cannot be counted against Pataki, but because the state derives so much of its growth from the financial sector in New York City, we should also avoid giving him too much of the credit, and we should remember that other parts of the country were hard-hit to ensure Wall Street’s continued success. There are a couple important things to notice here. First, New York’s poverty rate did not budge during Pataki’s first term, when he was engaged in deep tax and spending cuts, even though the nation as a whole was seeing significant improvement during this period. It only begins to move in the late 90’s when Pataki reverses course. 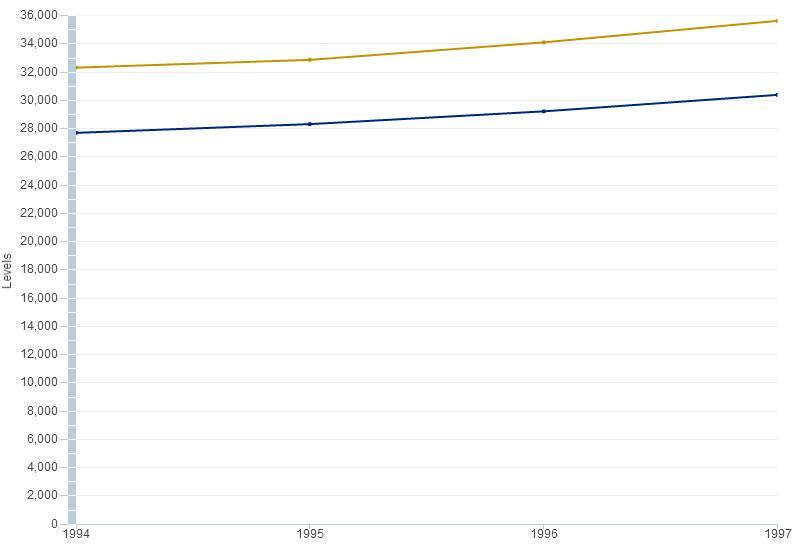 The nation’s poverty rate was 87.3% of New York’s when Pataki took office, but the gap had opened up to 79.5% in 1997. Over the rest of Pataki’s run, New York made up most of the lost ground, and when he left office, New York had closed the gap to 86.7%, almost recovering all the ground New York lost against the country between 1994 and 1997. 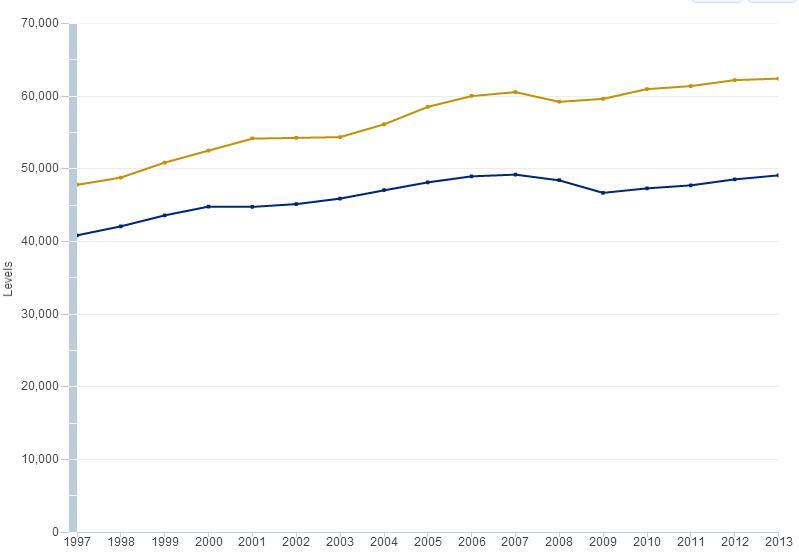 The economic crisis would push poverty rates back up, but New York came out of the crisis closer to the national average than it was at the start. In the last year for which this data series runs (2010), New York’s poverty rate was 93.0% of the national rate, though both rates were higher than they were in 2007. Like Huckabee, Pataki was not particularly right wing on economic issues, at least not past 1997. Huckabee has the better record on poverty, while Pataki has the better record on growth, but the difference on growth is likely mostly due to Wall Street’s influence. The core difference is that Huckabee’s policies were pretty good from the start, while Pataki fudged his first term and had to make up some ground after that. He acknowledges climate change, but he doesn’t want the government to enact policy to address it. He supports some gun control legislation. He doesn’t want to take federal action on gay marriage, but he supports a variety of gay rights. As governor, he was part of the tough on crime movement–this has drastically increased incarceration rates and is not judged by most researchers to be particularly effective in reducing crime rates. States that have gone away from this approach have gotten good results so far, and European countries with much more relaxed policies enjoy much lower homicide rates. Following the Ben Carson mold, he called Obamacare “the worst law of my lifetime” and vowed to repeal it. His proposed tax plan echoes the one proposed by Romney in 2012, which I was very critical of at the time in one of my earliest posts. There are some good things here–he certainly is not running as far to the right as Huckabee–but I’m particularly not impressed by his stances on the tax code and Obamacare. There’s been quite a bit of research done on those issues over the years, and it’s inexcusable to still be on the wrong side of those debates. Is Pataki faking it to get support from primary voters? Maybe, but we can’t be sure. I think we’re looking at a Mitt Romney type. Pataki is a blue state republican, and that means he’s quiet on social issues and has a moderate economic record as governor, but put him in national office and we’re likely to see a hard shift to the right as Pataki becomes unshackled from his relatively left leaning New York voting base. He shouldn’t be president. I remain impressed exclusively with Sanders. There will no doubt be more of these evaluations to come. This is an unusually crowded race, and this series has become more involved than I anticipated, but I aim to keep it going nonetheless. Martin O’Malley will be next.